1882-1899 autograph album that belonged to Berthia Williams of Steamburg, New York, a village in the town of Coldspring, New York. Most records show her as Bertha Williams, but she spelled her name as Berthia on the reverse of the first end paper. The album was a present from Berthia's cousin Ranie E. Hotchkiss, who inscribed a presentation page and another page. 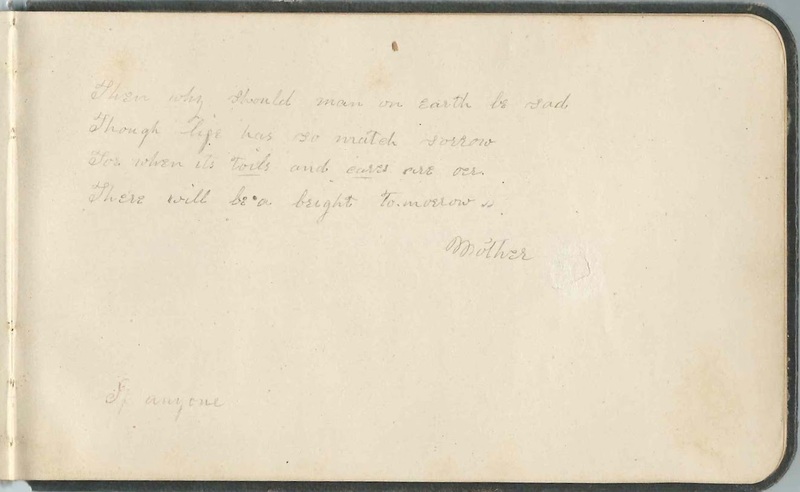 The album measures approximately 7" x 4-1/4" and contains the sentiments of about 50 of Berthia's relatives and friends. An alphabetical surname list and an alphabetical list of the signers, together with any personal information they offered, appear at the end of this post. Berthia's mother inscribed facing pages near the end of the album. Berthia's older sister, Emily (Williams) Barton, wife of Francis M. Barton, inscribed a page at Steamburg, New York, on January 18, 1886. Other relatives who inscribed pages were Aunt Matilda; Cousin Ida Williams; Aunt Annie. 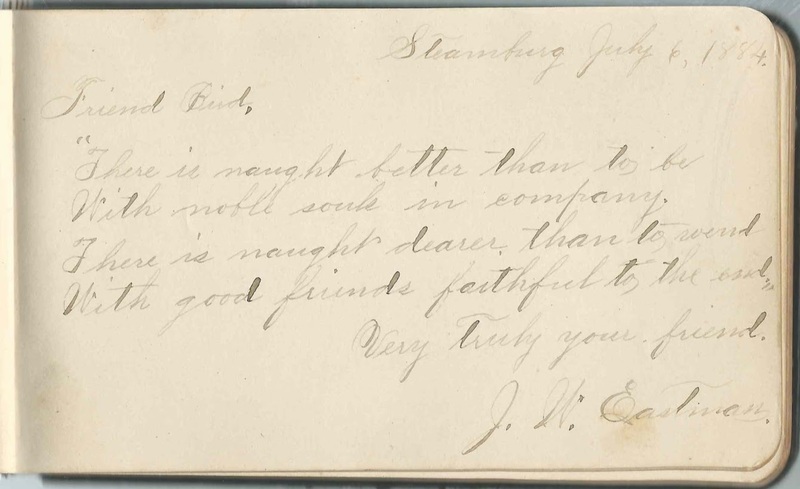 And it's likely that the J. W. Eastman who inscribed a page at Steamburg, New York, on July 6, 1884, was John W. Eastman, Berthia's future husband. His mother, Elvira Eva (Wellman) Eastman, also inscribed a page. John and Berthia lived at Coldspring, New York and had at least one child, daughter Millie M. Eastman. John died in 1922 and Bertha in 1933. They're buried at the Steamburg Cemetery, with Eastman and Williams relatives. Beyer Hamilton Oviatt  S W ? Annie; Berthia's aunt. Looks like C. Annie or G. Annie. Emily M. Barton, signed at Steamburg, New York, on January 18, 1886; called herself Berthia's sister. J. W. Eastman, signed at Steamburg, New York, on July 6, 1884. Presumably John W. Eastman, Berthia's future husband. Written on the page upside down: Lenna Gilbert of Almond, New York, signed on April 7, 1886. Mrs. G. W. Knapp, signed at Wellsville, New York, on April 7, 1886. She included her birth date: Jan 19, 1834. She was Fannie (Oviatt) Knapp, wife of George Washington Knapp. G. W. Knapp of Wellsville, New York, signed on April 7, 1886. Like his wife, he included his birth year: Feb 27, 1830. He was George Washington Knapp, husband of Fannie (Oviatt) Knapp, who also signed a page.
? W. Lord, signed at Erie City, Pennsylvania, on January 30, 1882. Given name initial might be O.
Delia W., signed on "4-7-86"
Bertha Williams; album owner. It was given to her by Cousin Ranie. Most records show Bertha Williams.